Creating an atmospheric horror that's more a parable about the creeping darkness of depression is the MO of David Sandberg's expansion of his Lights Out short film. In the James Wan produced flick, the monster haunting a family is Diana, a creature who disappears when the lights go on, but when the lights go out, it's full tilt terror. But at its heart, it's an effectively taut parable about depression that keeps an eye on jump scares as well. Relatively taut (though occasionally bogged down with parts of backstory) first time director Sandberg's Lights Out is quite effective at dealing out chills and the obligatory jump scares. The strength in Lights Out comes from the casually dropping in elements of back story to illuminate the characters and expand on the familial straining of the ties and relationships. But the whole piece works more effectively as a film about depression, as well as an occasionally dig your nails into the cinema chair fright fest. (That said, its ending and ultimate denouement is perhaps controversial in some aspects). However, it's Bello's turn as Sophie, the mother under pressure from demons both within and without that really stands out as this allegory for the creeping black dog is brought to life. Tapping into her own real life fight against bipolar disorder clearly helps her, and the subtleties brought to the fore by Bello's simple facials and odd looks of terror work wonders to underscore the inherent fear within. 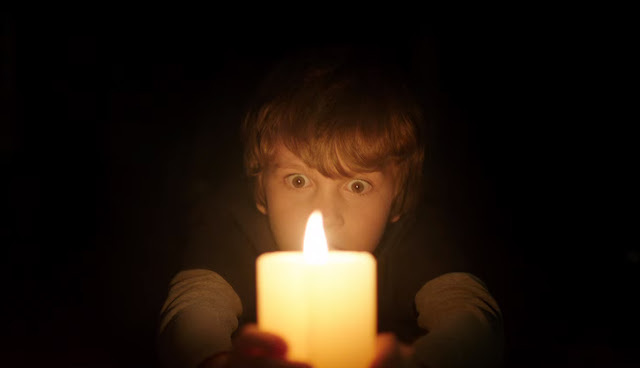 Ultimately, Lights Out is an effective and short chiller that does occasionally lapse into dumb horror movie territory, but seen as a wider cautionary tale about depression, it presents a more thoughtful allegorical piece to keep the horror genre fresh.